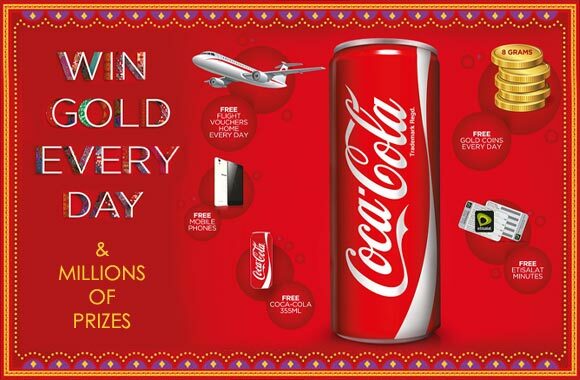 Excitement sweeps the UAE, Qatar and Bahrain, as Coca-Cola Middle East launches the ‘Win Gold Everyday' Campaign. The latest campaign by Coca-Cola Middle East offers consumers chances to win daily prizes ranging from Gold to airplane tickets to smartphones, to free minutes and of course, a refreshing Coca-Cola! Dubai, UAE, February 27, 2016: Coca-Cola Middle East has launched its latest consumer campaign, ‘Win Gold Everyday’ this month across the United Arab Emirates (UAE), Qatar and Bahrain. Residents in all three countries can now enjoy the refreshing taste of Coca-Cola with a chance to win daily prizes, ranging from eight grams of gold, to flight tickets, smart phones, free minutes from Etisalat (UAE) and VIVA (Bahrain), as well as Ooredoo (Qatar), not to mention free Coca-Cola cans. The daily prizes can be found by anyone, by looking under the ring tab or bottle closures of selected promotional Coca-Colas. Winners can redeem their exciting prizes at participating outlets or by calling the toll free number 8000MYCOKE in the UAE, 40339339 in Qatar or 80001005 in Bahrain. This offer is valid until April 30th 2016. The inspiration behind the ‘Win Gold Everyday’ campaign comes from the fact that many people living in the UAE, Qatar and Bahrain are expatriates who live far away from their families. In order to close the gap all the prizes up for grabs bring families together. Whether it’s free minutes to call them, or airplane tickets to visit them, Coca-Cola continues to spread happiness by bringing people together. Tolga Cebe, Marketing Director at Coca-Cola Middle East, says “We are very happy to be offering the community an opportunity to win millions of prizes every day. At the Coca-Cola Company, we appreciate and recognize the importance of family, especially when you’re apart, so we launched a campaign that makes the distance more endurable. In the spirit of partnership, we have also joined forces with respected companies like Lenovo, Etisalat, VIVA and Ooredoo in order to ensure consumers get the best possible prizes and opportunities. The ‘Win Gold Every Day’ Campaign is not the first time Coca-Cola engages the community with an opportunity to win daily prizes. The campaign is an extension of the Sprite Cricket Stars program, the UAE’s grassroots cricket tournament. Through Sprite Cricket Stars, Coca-Cola has provided the community a chance to enjoy cricket on the pitch, and off the pitch with a chance to collect runs and win prizes through the competition. Consumers in the UAE, Qatar and Bahrain have the chance to engage with Coca-Cola across various touch points, from stores and malls, to radio, to outdoor and films, as well as the product itself. "AURA Hospitality & Food Services"
Al Meera announces the opening of its 51st branch "Azghawa 2"